IFA 2015 highlights – Samsung, Sony, Technics and more | What Hi-Fi? Having beaten the competition to the punch with the release of the world's first Ultra HD Blu-ray player, we managed to dig-up a little more information on the player. It looks like we'll have to wait until spring 2016 to see it in stores and it's set to cost "under €500". Read on for more details. MORE: Samsung Ultra HD Blu-ray player to cost "under €500"
Big pictures from small boxes placed at short distances. That's the plan with Sony's new Portable Ultra Short Throw projector, which can produce a 50in image when placed just centimetres away from a wall. And if you're more interested in a big-screen Android phone, then you'll want to run the rule over the Xperia Z5 - the successor to the Award-winning Xperia Z3. Following on from the company's first hi-res audio speaker, Onkyo launched a full range of wireless speakers in Berlin. There were full-size and compact, portable models on display. Harman-Kardon had new AV amps and wireless speakers on show at IFA, with a range of amps supporting 4K video and Spotify Connect, and Bluetooth speakers that come complete with the Tidal CD-quality streaming service. First out-of-the-blocks in the Ultra HD Blu-ray 'race' was Samsung, having released the world's first UHD Blu-ray player today in Berlin. In fact Samsung is the only company out of the blocks, with no word on any UHD hardware from Panasonic, Sony or anyone else from the list of likely backers. The player is due out "early next year" and sports a curved design in line with Samsung's SUHD TVs. No word on pricing as yet. Not content with announcing a new Technics turntable, there was also news of the first pair of headphones since the Technics brand relaunched. The EAH-T700 headphones feature a two-way driver array, sport a stylish metal finish and will come with a price tag around the £1000 mark. Philips is never one to rush its new products, so it is that we're seeing the company's 2015 4K TVs for the first time in September. Alongside the UHD TVs - including a new 'Ambilux' take on Philips Ambilight - there were three new soundbars and two multi-room music speakers, part of a new 'Izzy' range. What do you do to give your award-winning headphones a new lease of life? Make them wireless, according to AKG. These new Bluetooth cans are a variation on the excellent Y50 headphones. Audio-Technica showed-off a brand new budget USB turntable. Due in shops later this month for £330, it's a direct drive turntable with a MM cartridge and the option to record your vinyl straight to digital. Bang & Olufsen has a new wireless speaker, the BeoPlay A6. A hefty slab of speaker, it features AirPlay, Bluetooth and DLNA and can connect to any BeoLink multi-room product. Onkyo released three new amplifiers earlier at IFA - two stereo models and an AV amp - and today it was the turn of a range of headphones. There are Bluetooth pairs and a set of "true wireless" buds that come minus any cable at all. Plenty of news from JBL, including a soundbar that promises to switch more seamlessly than ever between sound from your TV or from the device in your hands - phone or tablet - and wireless, noise-cancelling headphones. Pure chose IFA to reveal a whole host of new radios. A three-strong new range of Pure One radios, a flagship Evoke radio complete with wireless streaming, and a new Siesta bedside radio. Panasonic got IFA 2015 off to a flier with the release of the company's first OLED TV - a 4K OLED, no less. The TX-65CZ950 is filled to the brim with the latest TV tech - HDR support and THX certification, for starters - but comes with a suitably eye-watering price tag as well. Panasonic almost outdid itself when the company moved on to matters Technics. Not content with announcing the Grand Class G30 range and a new all-in-one system, there was an extra special 'one more thing'... A new Technics turntable. It may only have been a prototype but it was more than enough to get our analogue juices flowing. Slated for a 2016 release, it looks like the 8-year and counting Technics turntable hiatus will be broken. More details below. Not to be outdone, Sony went for quality and quantity with three new smartphones, including the flagship Xperia Z5 Premium, three new Walkmans, a hi-res desktop system and some TV news. Most of the company's sets have already been announced but there was a monster 75-inch 4K TV with all the trimmings plus news of an HDR update for existing ranges. Onkyo slipped out a pair of stereo network receivers, both around the £500 mark, plus a no-frills AVR for just £199. The stereo amps come packing plenty of new technology, from FLAC and DSD support to Spotify connect, while even the budget AV amplifier supports 4K. LG has already beaten the rush, announcing news of new flat and curved 4K OLED TVs. We expect to hear more tomorrow and see them in action on the LG stand once the rest of the show gets under way. Not to be outdone, Samsung revealed some wireless speakers before the new product announcements from IFA got up to full speed. The Wireless Audio 360 models aim to do exactly what it says on the tin, delivering room-filling sound and minimising the sweetspot. We expect to hear more from Samsung on Day 2 of IFA. One of the biggest stories to come out of IFA 2015 is likely to be the launch of the first Ultra HD Blu-ray products. If you've been waiting on a 4K disc format, the good news is it's coming - and it's likely IFA will see the first official products revealed. After confirmation of the disc logo and spec, we then got word from Panasonic that the first compatible products were on target for a September launch. Following the news last week that the BDA is beginning the licensing process, everything looks to be on track. With the likes of LG, Samsung, Panasonic, Pioneer and Sony all members of the Blu-ray Disc Association, we'd hope to see 4K players from a number of different manufacturers. Panasonic revealed a prototype 4K player at CES this year, so all eyes are on IFA for the finished product. As a result of the expected launch of Ultra HD Blu-ray hardware, there will be more attention that usual on the home cinema landscape. As well as new 4K Blu-ray players, we might see more 4K AV receivers - the HDCP 2.2. HDMI spec being crucial - from the likes of Pioneer and Yamaha. Soundbars are always popular, so we'd expect budget and premium options from the likes of JBL, LG, Panasonic and Philips, and a chance to see recently released models for the first time, such as the Canton Glass range (pictured, above). Although already announced and available to buy, Canton will be showing the new DM90.3 "home entertainment hub." Traditional home cinema speaker systems are an increasingly rare breed but we'd hope to see some new speakers on show. Dolby Atmos and DTS:X are the key tech trends here, so we'd expect to see at least a few Atmos-approved speakers and systems to go with those home cinema amps. Ultra HD Blu-ray is no good without an Ultra HD TV, so naturally we'd expect to see plenty of new 4K TVs at the show. Last year we saw everything from a Swarovski-crystal-covered curved OLED TV to details on new 4K TVs from Loewe, Panasonic, Philips and Toshiba. We expect to see new TVs - whether they'll be OLED, 4K or even bendable, seems the question. As ever, expect some flag-in-the-sand showing-off with plenty of "world's first" products on display - and that often comes in the shape of super-size TVs. LG Display CEO and president, Sang-Beom Han, is giving a keynote speech and new flat and curved 4K OLED TVs are expected to grab the headlines. The new screens will also be HDR-capable and the two curved models are said to be "thinner than any smartphone on the market"
It seems LG's improvements in OLED yield rate and subsequent investment in flexible OLED production are being put to good use. Hi-res audio and wireless systems were the key trends last year and we'd expect 2015 to follow along similar lines. The Technics brand relaunched at IFA last year (pictured, above), so a fresh batch of products would be welcome, while Sony chose last year's show to launch its new hi-res audio systems and a hi-res Walkman, the affordable NWZ-A15. Another hi-res push this year? Astell & Kern, Audio-Technica and Pioneer could also have new hi-res audio related kit. Multi-room wireless speakers will no doubt be popular again, too, with LG first out of the blocks to announce that the new Music Flow P5 and SoundPop 360 speakers will be unveiled at IFA. Samsung is expected to pull the wraps off the new Wireless Audio 360 speakers, which will join the company's R6 and R7 speakers unveiled at CES 2015. Sony and Panasonic could also add to their respective multi-room music systems, while we're confident that there will be more wireless Bluetooth speakers than you could ever imagine inside IFA's Messe Berlin exhibition halls. Onkyo has been keen to announce its new X9 portable speaker is the first "high resolution portable speaker", and will be on show in Berlin. IFA isn't normally a hot-bed for two-channel stereo kit - the Munich Show is the place for that - but there should still be a smattering of other hi-fi products for us to see. Turntables are of course very much back in vogue, so we'd expect to see budget and high-end products alike, perhaps with a focus on digital turntables, such as the Pro-ject Essential II Digital. With Audio Technica, AKG, Jabra, JBL, Monster, RHA, Sennheiser and SoundMagic just some of the headphone companies exhibiting at IFA 2015, we can expect to see a bumper crop of new headphones once again. One of the headphone highlights of the show will no doubt be the Astell & Kern Ti8e in-ears, the "world's first" headphones to use Tesla driver technology. Meanwhile, Onkyo will unveil the HR500M on-ears and E700M in-ears. They're said to be high-res audio products, but most likely only when connected to compatible source material. With wearables such as the Apple Watch the talk of certain parts of the tech world, expect to see a focus on smart headphones that deliver a level of health- and fitness-tracking. Wireless Bluetooth headphones naturally lend themselves better to the sports market, so expect plenty of those, but we'd reckon on plenty of standard in-ear and over-ear designs from the big European headphone brands, too. It looks like the Samsung Galaxy Note 5, the successor to the Galaxy Note 4, will be released ahead of IFA, but we'd expect to hear plenty about it over on the Samsung stand regardless. LG is likely to counter with a phablet of its own, possibly the LG G4 Pro, a super-size version of the flagship G4. How about flexible phones? With LG's focus on flexible OLED displays, some company for the G Flex 2 could well be in the pipeline. A reveal at IFA is probably a longshot, however. HTC, Huawei, Microsoft, Motorola and Sony will all be at the show, and could announce new phones, tablets and smartwatches. HTC may say more about its virtual reality project, HTC Vive (pictured, above), which HTC has confirmed will be on display at the show. 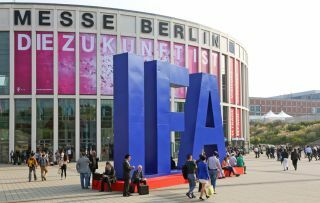 Whatever is announced, rest assured we will be bringing you news, hands-on reviews and videos of the best new IFA products, live from Berlin.